Can I Protect My Business Against Divorce? Many business owners have put in a lot of hours and lost a lot of blood, sweat and tears in the process of building their business. That’s why it can be so difficult when a spouse decides on a divorce, possibly putting business assets in jeopardy. 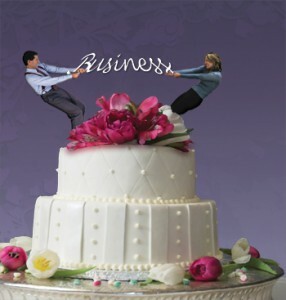 According to the National Marriage Project at the University of Virginia, as many as 40 to 50 percent of first time marriages end in divorce, so you should carefully consider how your business might be impacted from a marital split. Keeping records for business and family very separate. Consider whether paying yourself a good salary in the short term and using the excess to fund your own retirement is a good option. Banking on selling the business and taking a lower salary in the short term can be dangerous if you find yourself strapped for cash and your retirement dreams washed away because of a divorce. Consider what other assets you’d be willing to give up. You may want to fight for 100 percent ownership of the business interest, but you may need to negotiate by giving up other things. Buy-sell agreements, insurance, and trusts are all tools that can be used to held shield the business from unexpected changes in your personal life. Discuss specifics with a New Jersey business and estate planning attorney by contacting info@lawesq.net.